Prototype (P) – These are purpose built race cars and the quickest in the series. 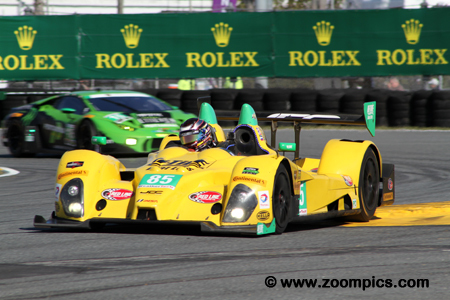 Included are Daytona Prototypes from the Grand Am series and P2 cars. Prototype Challenge (PC) – This is a spec class using the ORECA FLM09 powered by Chevrolet LS3 engine. GT Le Mans (GTLM) – Cars in this class are highly modified production vehicles from manufacturers such as Ferrari, Porsche, Chevrolet, Ford and BMW. GT Daytona (GTD) – This is also a production based class but does not allow the level of changes that can be made to GTLM cars. Vehicles in the category include Audi, Porsche, Ferrari, Lamborghini, BMW and Dodge. Daytona Speedway hosted the opening round of IMSA’s WeatherTech series. Starting Saturday afternoon, teams would race for twenty-fours around the twelve-turn 3.56-mile track. Fifty-four cars (Prototype – 13-entries, Prototype Challenge – 8-entries, GTLM – 11-entries, GTD – 22-entries) were entered for the fifty-fourth running of the event. The No. 2 Honda-powered Ligier JS was shared by Scott Sharp, Johannes van Overbeek, Pipo Derani and team principal Ed Brown. The car started from the second grid position but Derani jumped to an early lead pacing the field for the first twenty-six laps. The team was in contention the entire race and led the final forty-five-laps to score the overall win and Prototype class victory. Starting from the pole-position was SMP Racing Nissan BR01 driven by Maurizio Mediandi, Nicolas Minassian, Kirill Ladygin and Mikhail Aleshin. 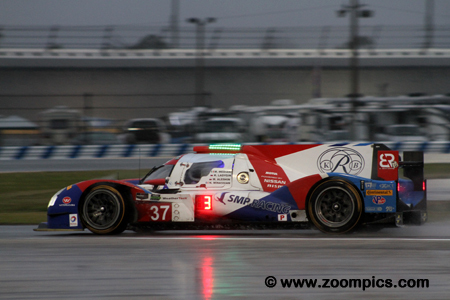 At the start, Aleshin was passed by the Tequila Patron and Mike Shank Racing entries. A series of problems left the team 119-laps behind the winning car when the checkered flag flew. They finished ninth in class and thirty-seventh overall. Franz Konrad entered one of the new Lamborghini Huracan GT3s for himself, Lance Willsey, Rolf Ineichen and Fabio Babini. The car was gridded second in the GTD class and Babini passed the category leader with just nine-minutes left in the race. Unfortunately, just six-minutes later the car ran out of gas. 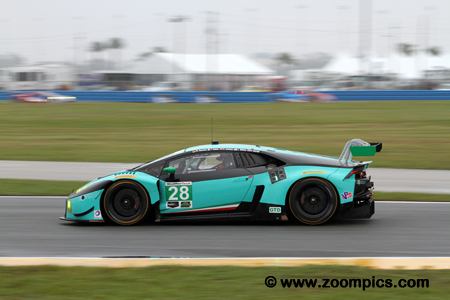 The Konrad Motorsports team finished twenty-fourth overall and tenth in GTD. The No. 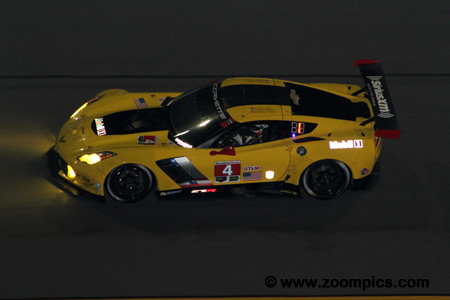 4 Chevrolet Corvette C7.R scored the GTLM victory. The car shared by Oliver Gavin, Tommy Milner and Marcel Fassler qualified twenty-eighth overall and seventh in class. It wasn’t too long before the Corvettes were racing with the cars leading their category. By the fourth hour Milner, was out front. Despite a lot of pressure in the final hour, the Gavin/Milner/Fassler squad was able to hold off their teammates. With less an hour in the event the two Corvettes ran in tandem with the No. 3 driven by Antonio Garcia, Jan Magnussen and Mike Rockenfeller trailing their teammates. Corvette Program Manager informed the crews that there were no team orders. Garcia chased and passed Gavin but surrendered the lead when he went wide in turn-one. 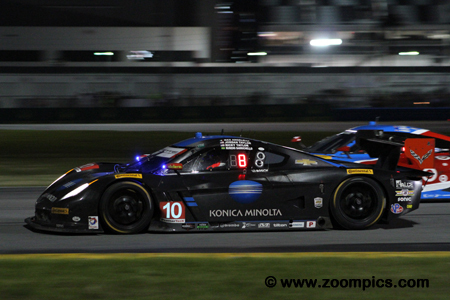 After 24-hours, Garcia finished just 0.034-seconds behind the No. 4 Corvette. Rene Rast was behind the wheel of the Magnus Racing Audi R8 LMS GT3 when he was passed by the Konrad Motorsports Lamborghini. With three-minutes left in the race, the Fabio Babini in the Konrad car ran out of fuel handing first place and the GTD class win back to Rast. Rast shared the victory with car owner John Potter, Andy Lally and Marco Seefried. Finishing just 3.048-seconds behind the GTD class winning Magnus Racing Audi R8 was the Black Swan Racing Porsche 911 GT3 R. The Black Swan Porsche driven by team principal Tim Pappas, Nicky Catsburg, Patrick Long and Andy Pilgrim started eighteenth out of twenty-two GTD cars. Staying out of trouble and a steady drive netted the team a second in the category. The No. 85 Prototype Challenge ORECA FLM09 piloted by Stephen Simpson took the early class lead. Simpson and his co-drivers – Chris Miller, Misha Goikhberg and Kenton Koch - started from the fifteenth position which was the second quickest in the category. At the end of 24-hours, the team had completed 702-laps winning Prototype Challenge by a margin of 3-laps – although they were leading by eighteen-laps at one point. 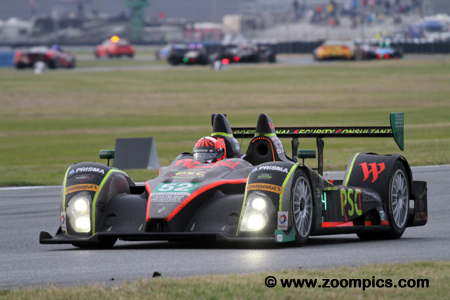 Finishing second overall and in the Prototype class was the No. 10 Wayne Taylor entered Chevrolet Corvette DP. The team started fourth and the car was shared by Ricky Taylor, Jordan Taylor, Max Angelelli and former F1 driver, Rubens Barrichello. Always in contention for the win, Angelelli finished 26.166-seconds behind the winning car. 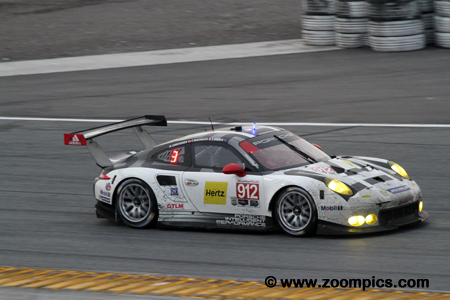 The second Porsche North America 911 RSR was driven by Earl Bamber, Frederic Makowiecki and Michael Christensen. The car was gridded in the twenty-third position - behind their class pole-winning teammates. Hopes for a victory rested on them when the No. 911 Porsche encountered problems. In the final hours, they were running second in class but were passed by the No. 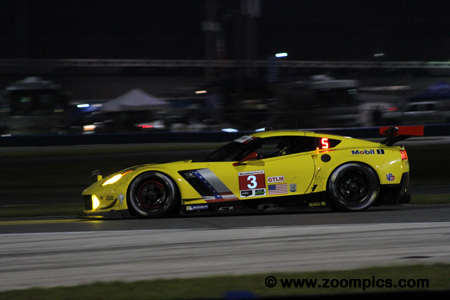 3 Corvette and finished third in GTLM. 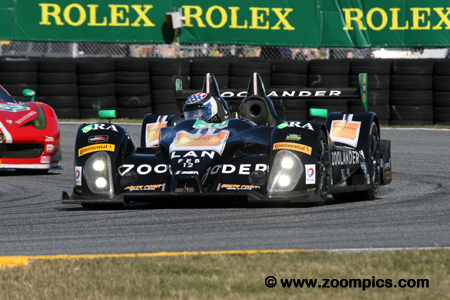 By the fifth hour, Olivier Pla had put the Michael Shank Racing Ligier JS P2 into the overall lead. The car which started third was shared by John Pew, Oswaldo Negri and A.J. Allmendinger. The Shank Ligier was the dominant car until the tenth-hour when the engine failed with Negri behind the wheel. The team retired after 285-laps – finishing fiftieth overall and eleventh in the Prototype class. Winning the GTD pole was the No. 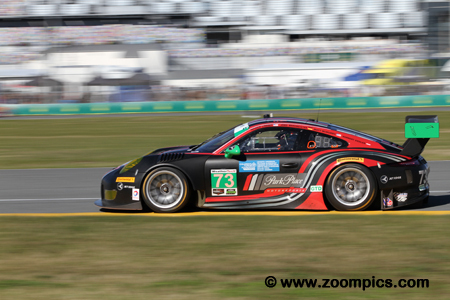 73 Porsche 911 GT3 R entered by Park Place Motorsports. Joining veteran Porsche driver, Jorg Bergmeister was Patrick Lindsey, Matthew McMurry and Norbert Siedler. The car was leading at the fifteenth-hour but a one-lap penalty dropped the team down the running order. 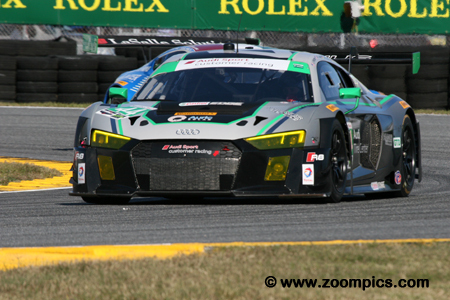 Additional issues plagued the team and they finished seventeenth in GTD and forty-first overall. The No. 25 BMW M6 GTLM of Team RLL ran third, behind the two Porsche entries, in the early going with Bill Auberlen at the wheel. Auberlen shared the car Dirk Werner, Augusto Farfus and Bruno Spengler. However, they were unable to keep pace with the class leading Corvettes and Porsches. 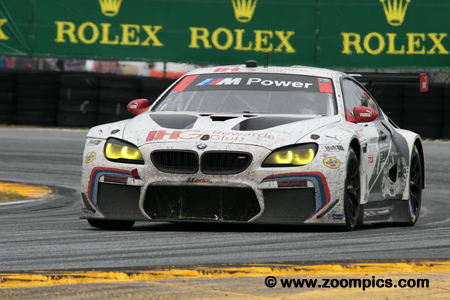 The BMW finished one-lap behind the class winner – fifth in GTLM. 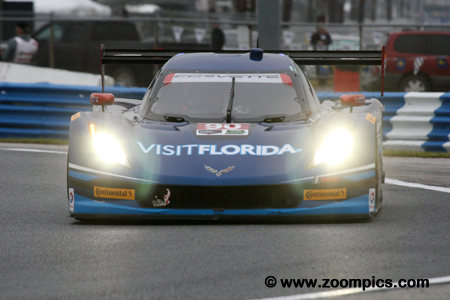 The Visit Florida Chevrolet Corvette DP started from the eighth grid position and scored the final spot on Prototype podium. Sharing the driving duties were Ryan Dalziel, Marc Goossens and 2012 IndyCar Series Champion, Ryan Hunter-Reay. The team only led a total of twenty-four-laps but ran with the leaders in the last half of the event. 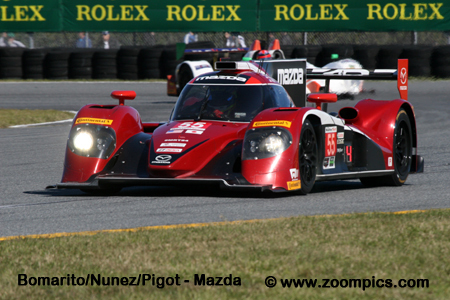 The PR1/Mathiasen Motorsports ORECA FLM09 started twentieth overall and seventh in the Prototype Challenge class. The driver line-up included 2015 24-Hour category winner Tom Kimber-Smith – he was joined by Robert Alon, Jose Gutierrez and Nicholas Boulle. They finished second in Prototype Challenge – four-laps behind the class winning team. 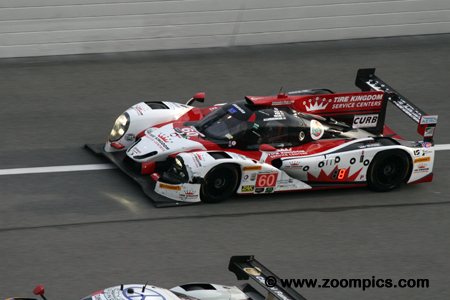 Starting on the pole in the Prototype Challenge class was the ORECA FLM09 entered by BAR1 Motorsports. The driver line-up included Tomy Drissi, Marc Drumwright, Johnny Mowlem and Ricardo Vera. Suffering some setbacks during the race the team finished twenty-ninth overall and third in the Prototype Challenge category. Starting twenty-second overall and first in GTLM was Patrick Pilet, Kevin Estre and Nick Tandy in the Porsche North America 911 RSR. Tandy jumped into the GTLM class lead and was followed by his teammates in the No. 912 Porsche. The Porsches diced with the Corvettes but a number of problems dropped the No. 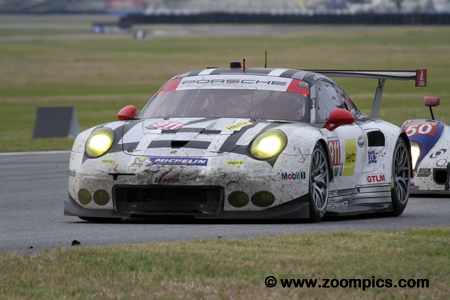 911 down the running order – the team finished thirty-third overall and eighth in GTLM. Riley Motorsports entered two Dodge Viper GT3-Rs. The No. 93 car qualified fourth in GTD and thirty-sixth overall. Piloting this car was Ben Keating, Gar Robinson, Jeff Mosing, Eric Foss and Damien Faulkner. 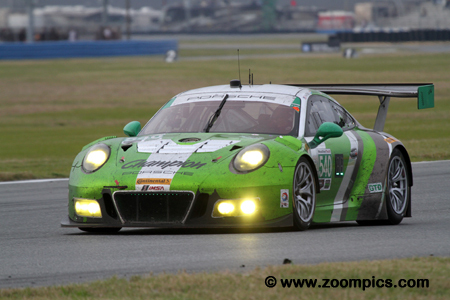 The team ran a steady race and at the checkered flag were third in GTD and sixteenth overall. 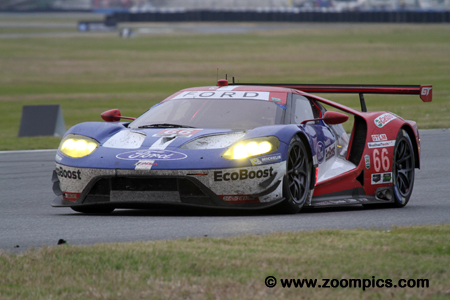 Chip Ganassi Racing entered two of the new Ford GTs. Unfortunately, the No. 67 car encountered driveline problems in the first hour. The No. 66 car was next to have issues when a brake line was damaged during a wheel change. These were just the first of many setbacks the Ganassi team had to resolve. Despite these challenges, both cars were running at the finish – No. 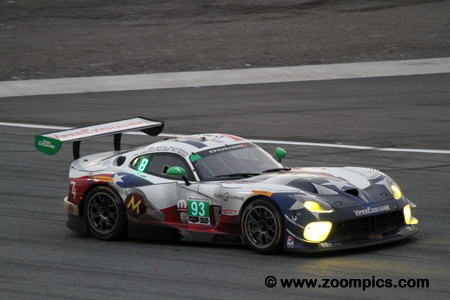 66 was seventh in GTLM and the second car was ninth in class.